This was taken as the front moved through around noon today. The air temps were falling, barometer was dropping and the bait was schooling into tight balls. After seeing that large school of bait in the pic above I set out some downlines about 20 feet deep and hooked up a couple rods. After boating the fish I lost the small school so I scrolled back in history, touched my screen where I saw the fish, hit Waypoint on my Simrad and went right back to where they were. You can see the fish best on the side scan right where the cursor is. Here is the shot once I got back on my waypoint. You can see some Stripers on the side scan 30 to 40 feet to the left of the boat. You can also see fish on the echo screen on the bottom. We actually fought 2 Stripers on this screen. One is at the left of the screen at 20 feet. 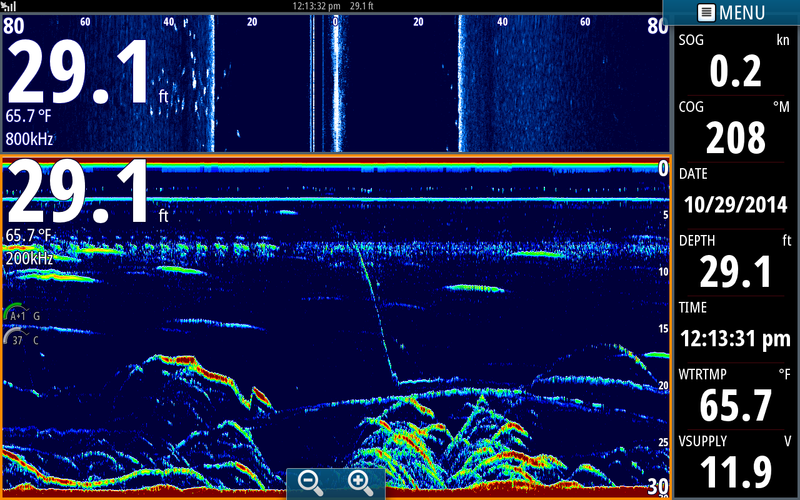 You can barely see the bait [white broke up line] then the fish hits [red zig zag line]. 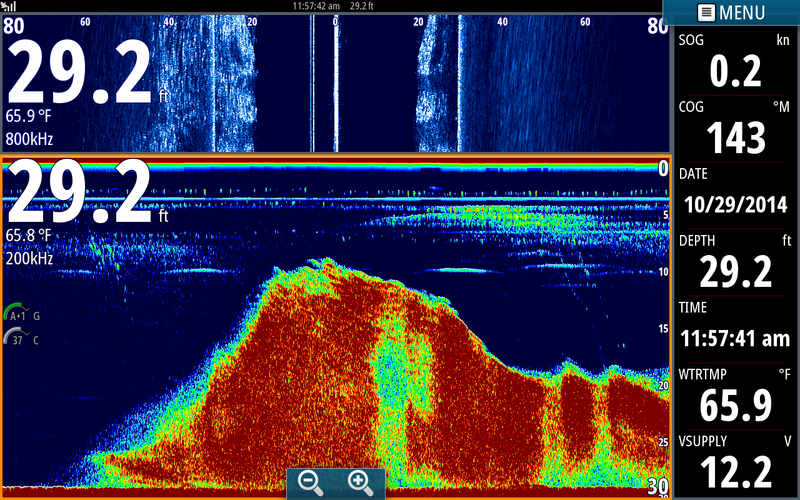 That fish swam directly away from the boat and out from under the transducer. 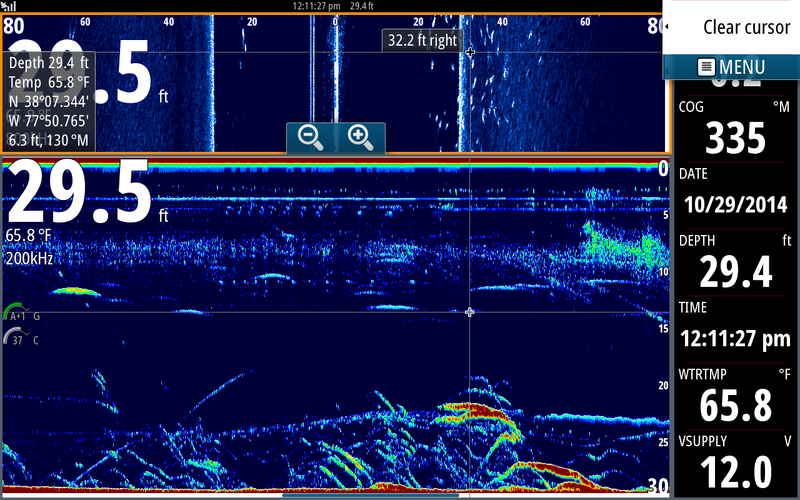 Then in the middle of the echo screen you can see me lowering a bait then locking in the reel at 20 feet. The boat moves about 15 feet then that bait hooked up with a Striper. This rod was in the middle of the boat and in the extreme edge of the cone so the signal of the fish was week. The fish came up out of the school of Stripers, hit the bait and swam out from the boat. Cloudy and 61* in the morning with falling temps midday, Water temperature 65* and Clear. Today my clients wanted to experience the whole deal so they met me at the ramp at 4:30 then went with me to catch bait. It was so warm this morning I wore shorts and a short sleeve shirt. Later in the day I would regret that move. I looked for Stripers this morning but all the bait was less than 15 feet deep and I saw no fish that we could put downlines on so I decided to pull a flat ranging from 3 to 16 feet deep with boards. I had 6 baits that were 7 to 10 inches long out and the rest were rigged with Herring. After 10 minutes all of the big baits were clobbered along with some of the Herring. Lisa had boated the largest Striper of her life and David had caught a nice one as well. I only made one pull on it then the fish moved out to deeper water as the sun was trying to break through the clouds. For the rest of the day we banged them on downlines. Today we caught about 25 fish and everyone had plenty of Striper to take home for the freezer.